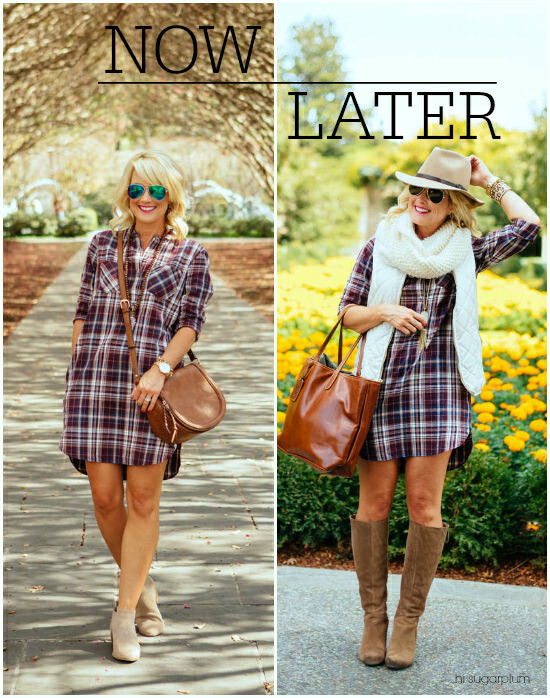 Plaid Shirtdress | Now & Later | hi Sugarplum! Wow, sounds like ya’ll are as big of a sucker for a good love story and wedding as I am! I’m thrilled you enjoyed yesterday’s post about my sister’s Montana River Wedding, and thank you for your kind comments. I made sure to pass them along to her…and my former stepmom, who helped plan the shindig. 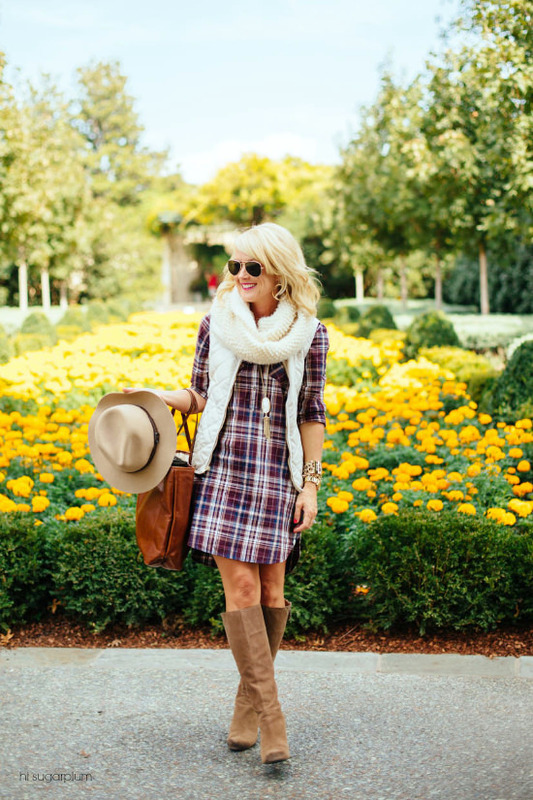 Well, the calendar may say October, but we’ve still yet to see any real Fall weather. 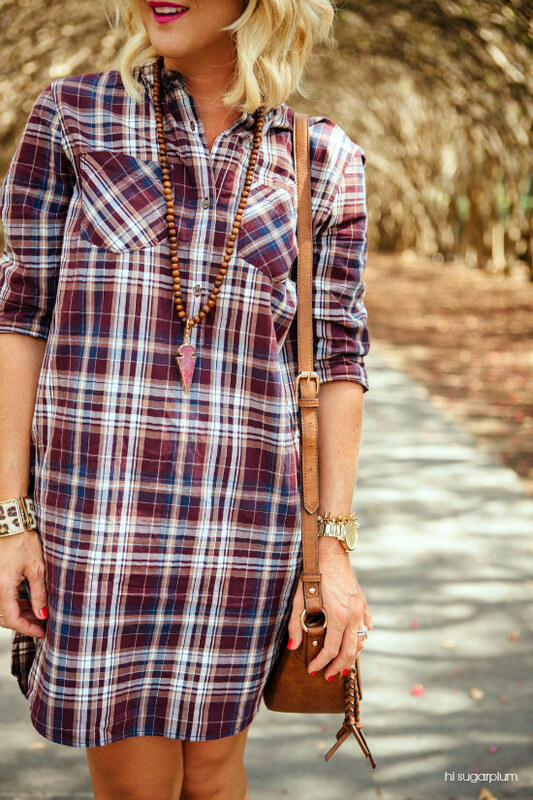 Which totally bites when you have cute new plaids and scarves to wear! 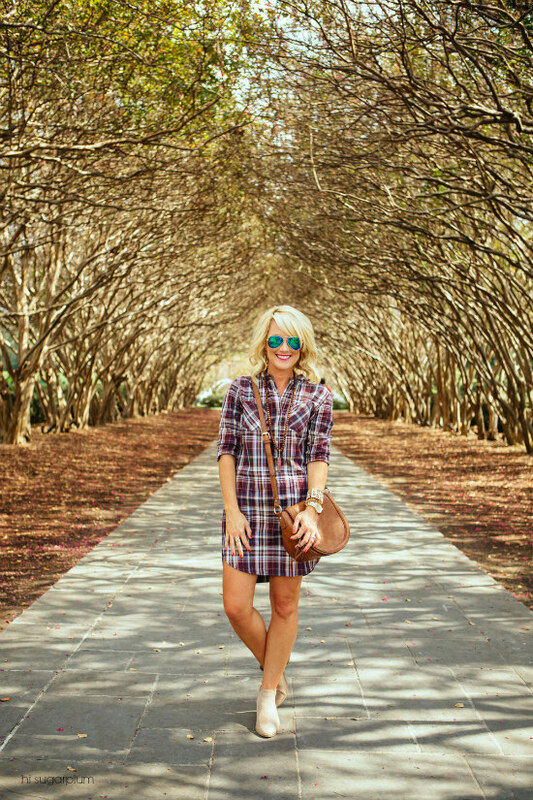 Transitioning our wardrobes to a new season always seems to cause some anxiety, so today I’m sharing another Now & Later…this time around this darling plaid shirtdress, and at Dallas’s prettiest spot to experience the seasons…the Arboretum. 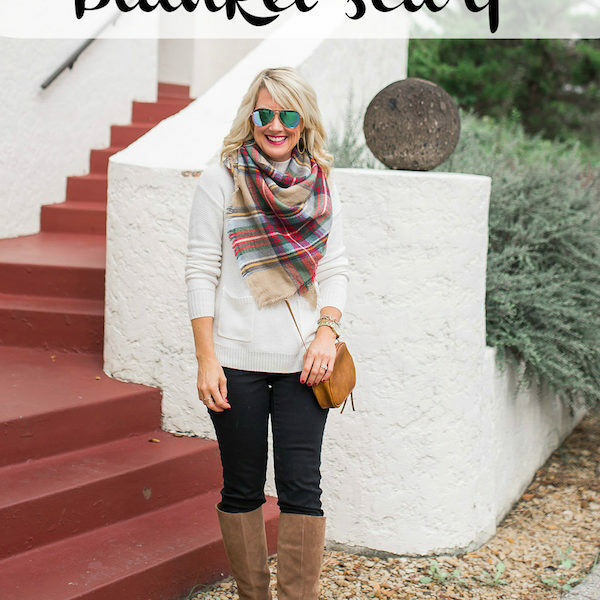 Many dresses can be worn year-round, and I simply swap sandals for booties. But the material of this dress is light enough for warm days, but the color and pattern combination is clearly Fall-specific (so I would put it away during the Summer months). 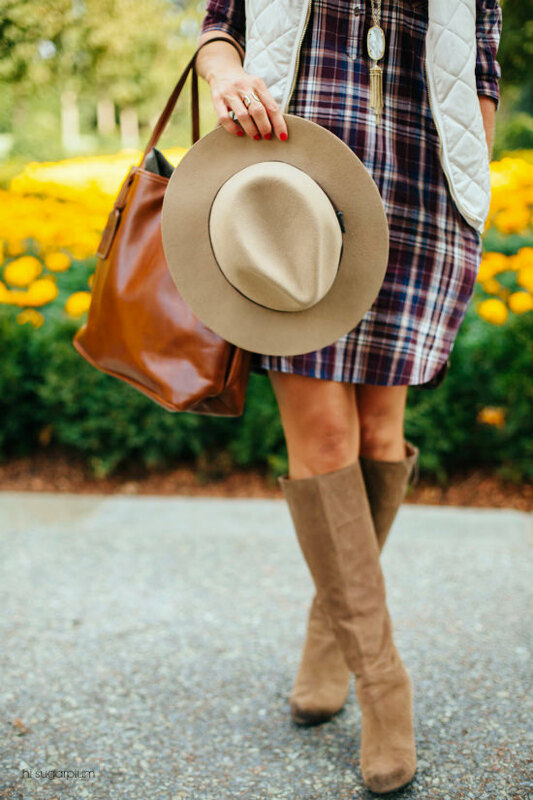 Boots can look clunky and heavy when worn with a dress, so I prefer a neutral color and streamlined shape for a more flattering look. 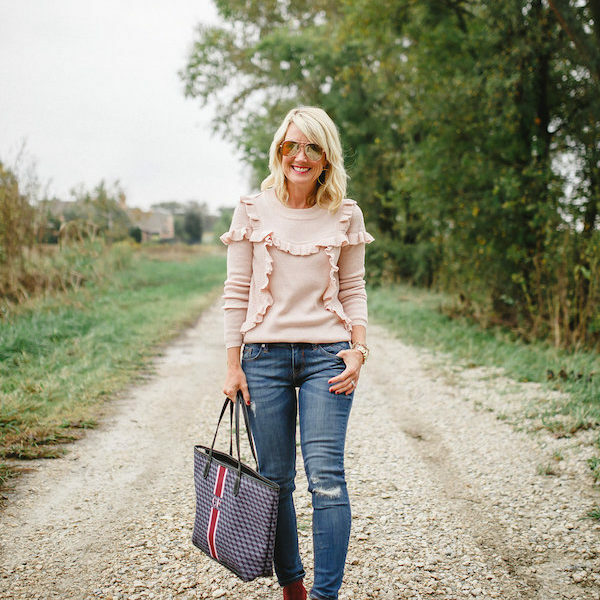 Clearly these low-ankle booties are favorites of mine this season, since I’ve reached for them almost every Fall Style post (see them all here)! 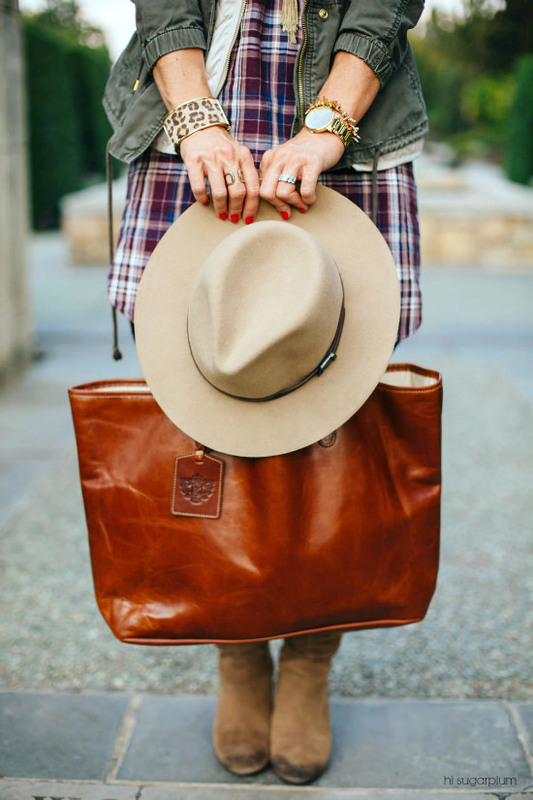 You’ve seen this bag several times already too, and unfortunately it keeps selling out. Don’t you hate when bloggers show things that aren’t available?!? But as much as I’d like to, I can’t exactly buy a new one every time. I did find some really great similar options though. Fit Tip: These booties run true-to-size, but require an extra-low sock (I wear these) to avoid peeking out. 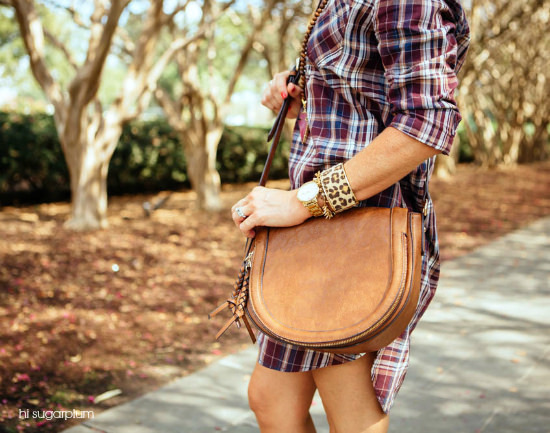 I added the leopard cuff for a touch of pattern-mixing, and that whole Rule of Three thing. 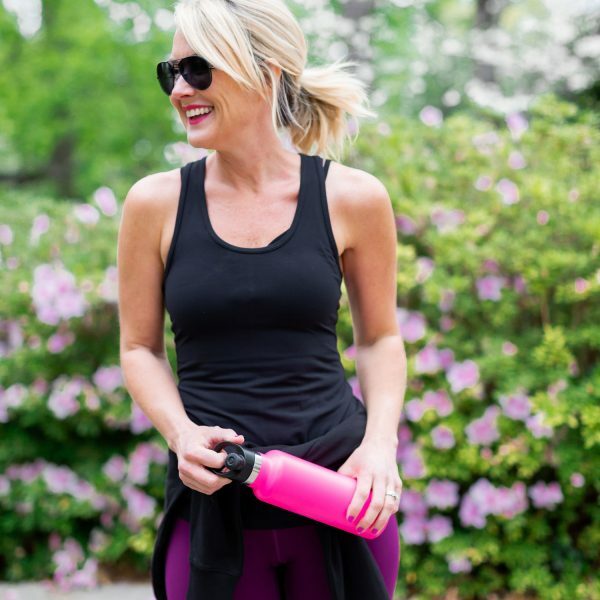 Fit Tip: The dress is women’s sizing, and true to size. I’m wearing an XS. 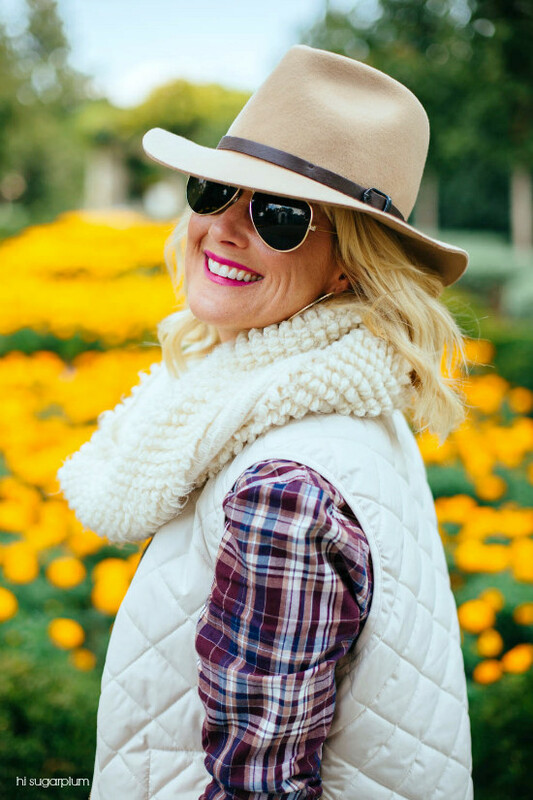 Now let’s fast forward 30-degrees, and style the same dress for cooler days by layering a vest and scarf. Swapping knee-boots for the booties added some warmth, too. 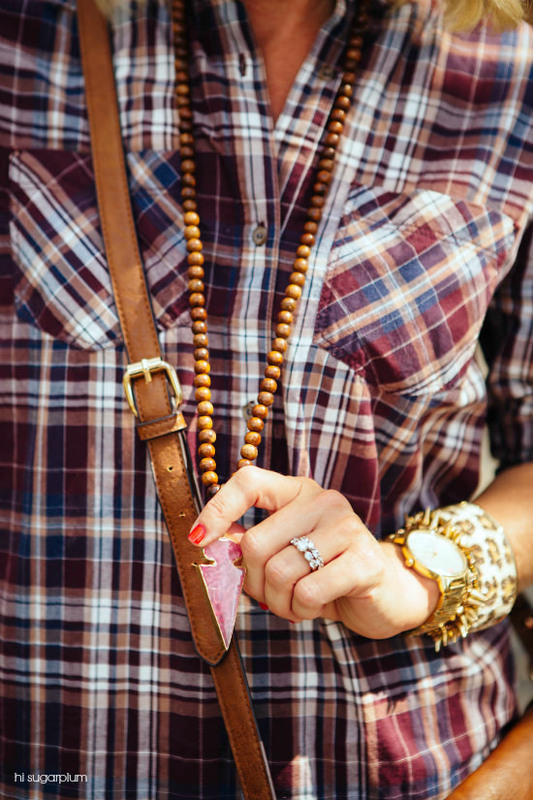 Style Tip: Try tone-on-tone layers for subtle pattern and texture. Keeping them all the same shade allowed the plaid to remain the star. 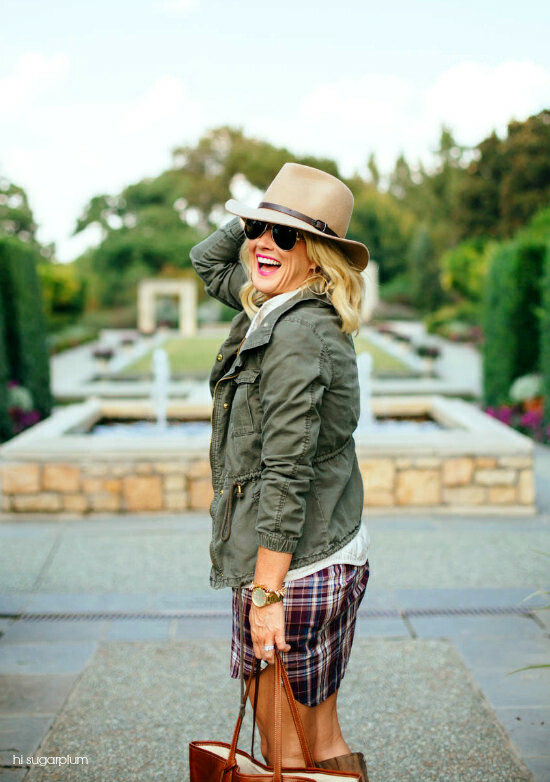 Style Tip: I frequently hear the comment, ‘I wish I could get away with wearing a hat!’ You want my advice for that? Just wear the hat! All anyone needs to pull it off, is the confidence to wear it. I prefer the brim be twice the width of my face…no wider, no smaller. And when it cools down even more, I’ll add an additional jacket layer. I guess these posts should technically be called Now & Later & Even Later. But that doesn’t have the same ring to it. This last pic was another squirrel-spotting reaction. Yes, I’m essentially a 14-year old boy. 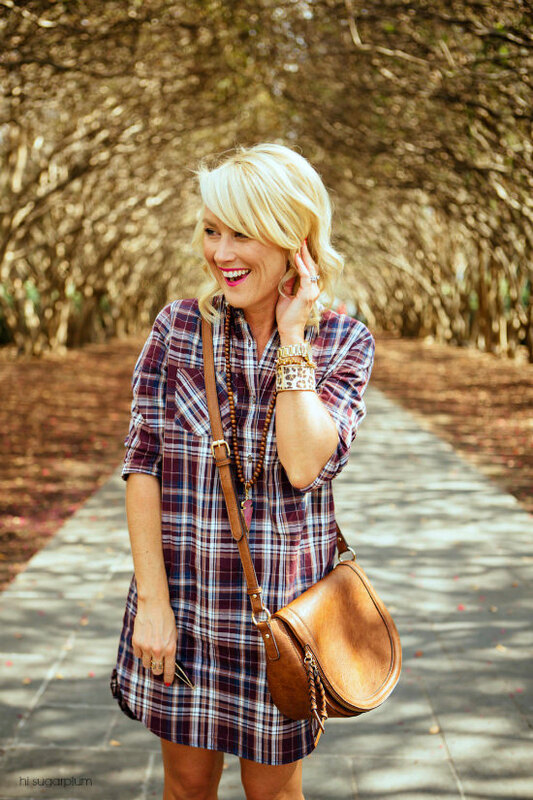 And once again, I teetered perilously close to heatstroke shooting these looks for you, so I hope you found some new Fall inspiration! Make sure you come back tomorrow…we’ve got Week 2 of the One Room Challenge to recap. Also known as, a major hiccup. 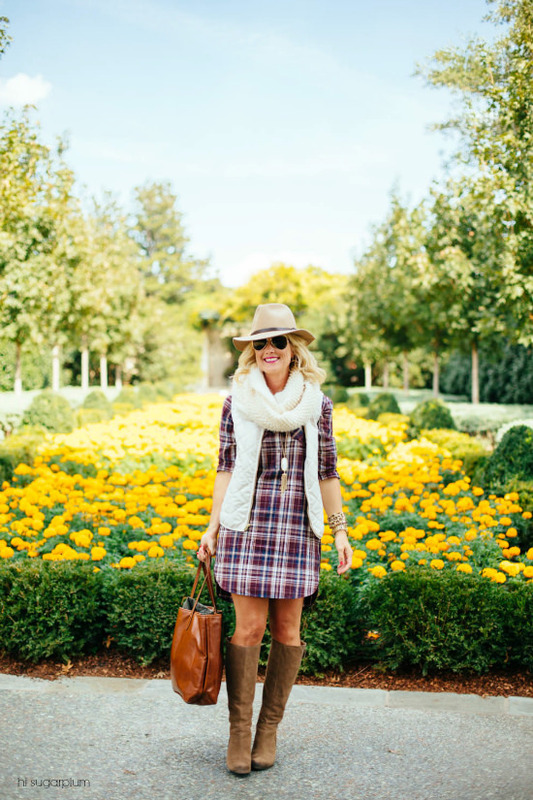 Thank you, Mary Summers, for the fabulous pictures, and Bailey at The Dallas Arboretum for a fun afternoon! THIS POST IS FABULOUS!!!! You look AMAZING, and the pictures are gorgeous!!!!! I actually love the green jacket layered over the plaid. Sorry it was so hot out when you were preparing these looks. I remember doing that for my daughter's youtube channel. She would always be out there in weird weather with different style clothes on. So cute! Hats do look great on you! I'm not sure I can wear one because of my curly hair. Im afraid it would be a full day commitment. Lol Maaaaybe I'll try one sometime and see if I can prove myself wrong. Just when I think you can't get any cuter you pull off adorable pix like this….and just when I think you could not be any funnier…#bignads…I almost spit my coffee. 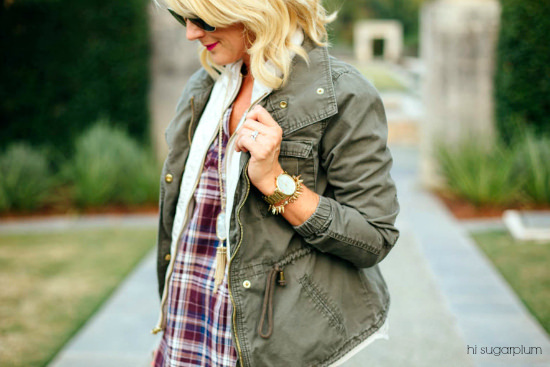 Love this look and all the layers….totally feel ya on the heat stroke. I hope Texas gets the memo soon!! I just cannot get over these pictures! Between today's post and yesterday's…you're killing me with fabulousness! 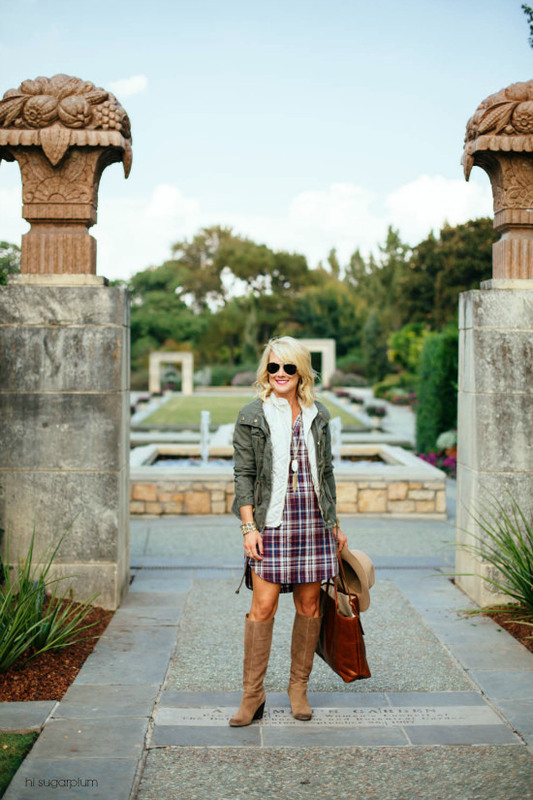 I would so pair this dress with some black leggings and Tieks…that's just my thing, though…loved you in the boots! I have super skinny bird legs and boots of any kind look a little clunky on me! Btw…#donttouchthatsquirrelsnuts #namethatmovie…Charlie and the Chocolate Factory! One of my kids' favorite! 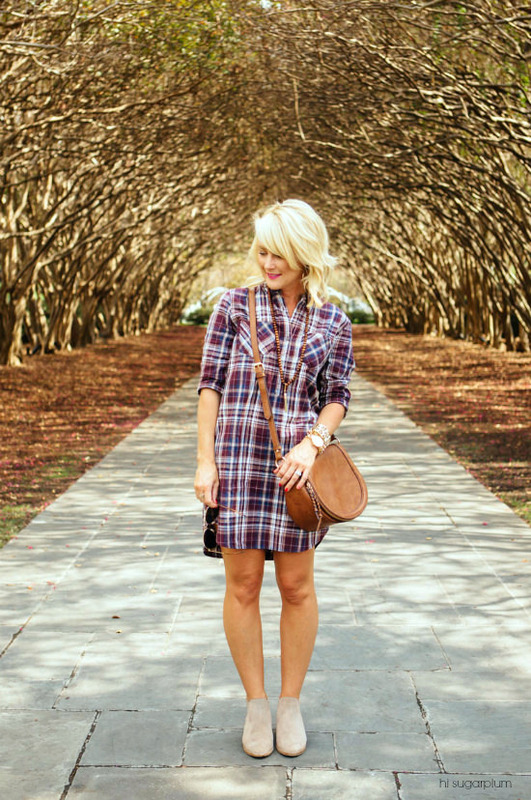 I looove a plaid shirtdress…and I love these looks you put together with one! I know you posted a link with similar style boots but can you share what brand are the ones you're wearing? I swoon over them every time you have a post with them! Love this dress! you look gorgeous in all these shots! These are the cutest photos ever! You look darling. I LOVE these looks! 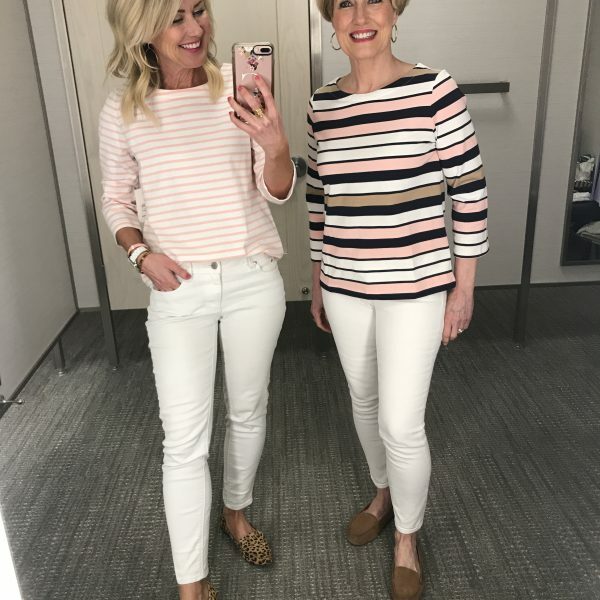 I have the same jacket and I love how you tied the front waist ties so they weren't all dangling down…great idea, will have to steal that:) Thanks for all of your tips! Adorable! As per your usual. 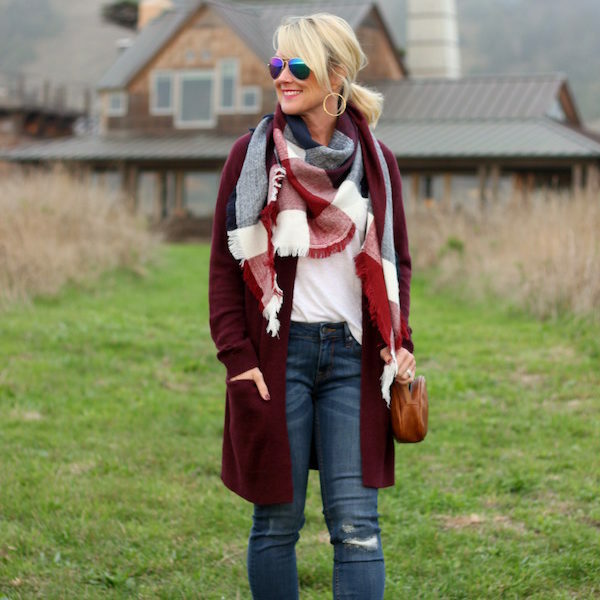 Love this blog and enjoy your pics. I have that exact ON vest but can't decide how much I'll wear it with it being off white instead of real white. Does that bother you? 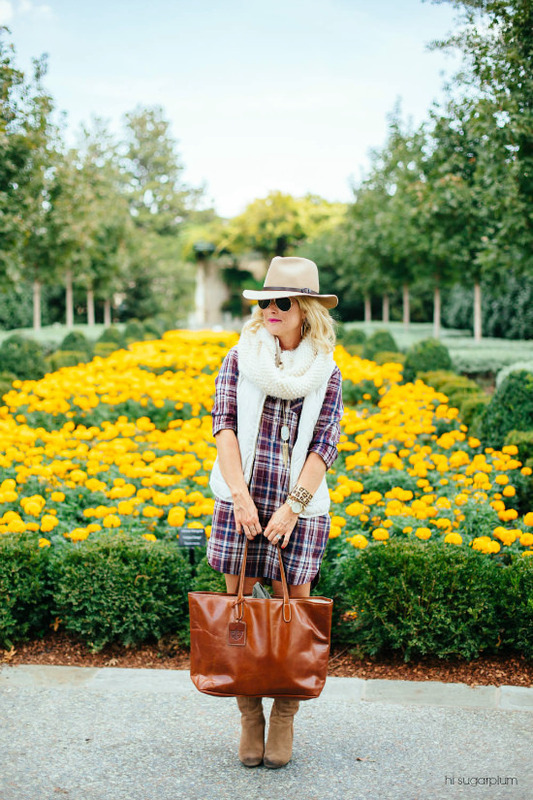 I'm ALL about plaid this year! I can't stop buying it. 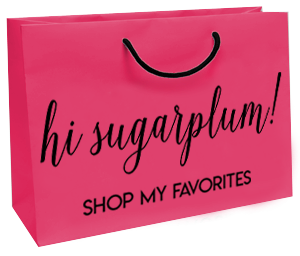 Thanks for showing so many ways to wear it – I can't wait to try them all out! 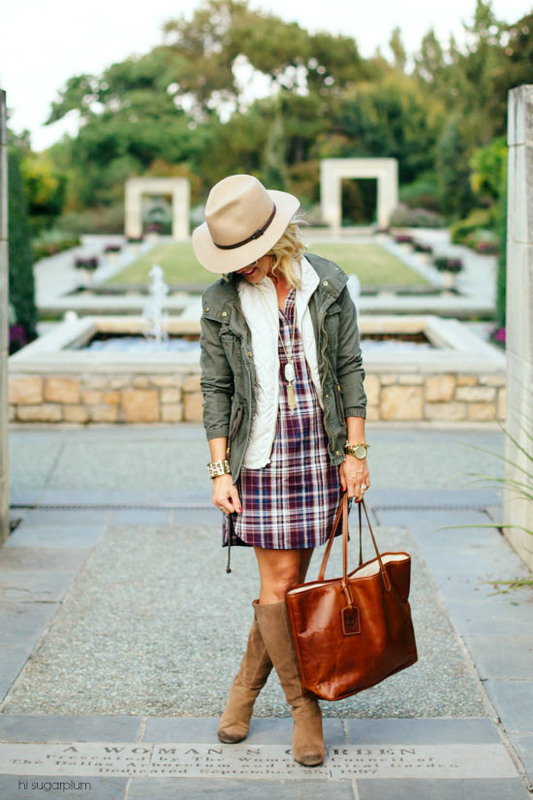 Love that dress and all the styling! do u have the info for that exact bag? I luv the stitching and rollover handle detail. I don't like when purses have an edge that is just a covering – it peels after a bit. so I like when they have a rolled edge. Thanks! I received this dress in the mail today! Love it!!!!! But…..im super long waisted so it's too short to pull off….leggings and boots?????? ?